The Motorola RAZR and Samsung Galaxy Nexus seem to be the two Verizon LTE juggernauts enjoying the lion's share of the spotlight, with the HTC Rezound's sandwiched smack dab between the two of them. But that doesn't mean the device has any less to offer -- you might even say it's entitled to some bragging rights. It's not the thinnest phone, nor does it have Ice Cream Sandwich (yet), but being the first carrier-branded handset in the US boasting a 720p HD display should carry a lot of weight.The Rezound -- as you might have gathered from the name -- is also the first HTC gizmo in the States to integrate Beats Audio. So does it fare well against its LTE competition? Is it enough to take your mind off of the Nexus? Read on below to find out. 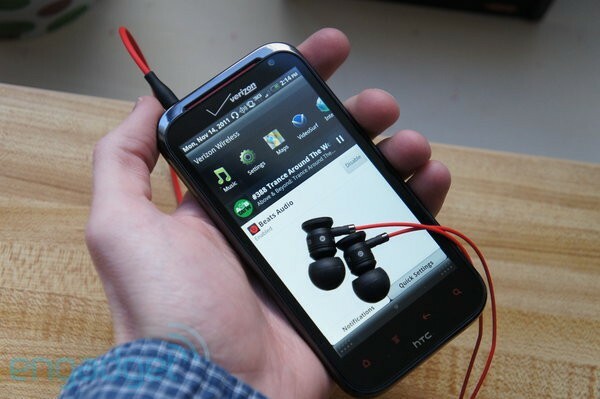 HTC Rezound review originally appeared on Engadget on Tue, 15 Nov 2011 15:00:00 EDT. Please see our terms for use of feeds.